Salt Lake City police officer won’t protect gay pride parade. Utah Police Officer Refuses to Protect Gay Pride Marchers. Religious Liberty in Action? 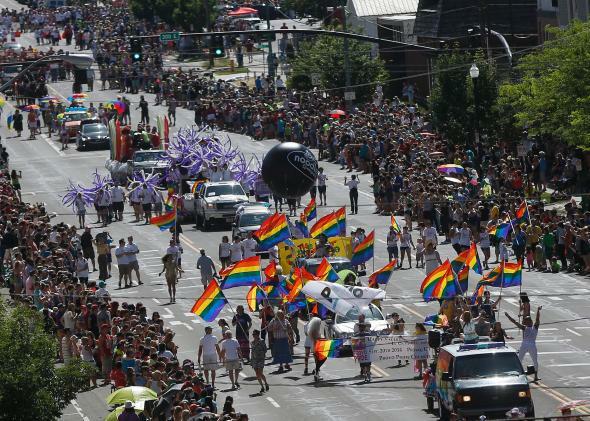 A scene from the 2014 Utah Pride Parade in Salt Lake City. The First Amendment guarantees any group the right to march through public streets to spread its message, regardless of its ideology. The Utah Constitution requires all police officers to “discharge the duties of [their] office with fidelity”—including the duty to protect those who are marching through the streets to spread their message. So what happens when a police officer disagrees with the message being spread by the marchers? Should he have the religious liberty to opt out of the duties of his office? That’s the question of the day in Salt Lake City, where an officer refused to guard a gay pride parade over the weekend because he dislikes its extremely political pro-gay message. The officer has since been placed on paid leave, but some conservative Christians have defended his refusal as an exercise of religious freedom. To them, the officer’s demurral is nearly identical to the baker, the florist, and the photographer who refused to serve gay weddings—and faced civil penalties for their defiance. I’ve made my views on this infamous trio clear: I don’t think generally applicable anti-discrimination laws can be trumped by personal religious principles. But I hope those who disagree with me there recognize that this most recent incident is far more dangerous than any previous case of LGBTQ religious refusal. The officers who protect pride marchers are not endorsing their beliefs or participating in the parade themselves. They’re merely protecting the safety of those who do choose to spread such beliefs. And allowing officers to opt out of their basic duty to protect citizens with whom they disagree is tantamount to valuing personal animus over both public safety and the First Amendment itself. Consider the abominable precedent the Salt Lake City case could set. If we accept that idea that protecting parade participants amounts to endorsing their ideology, then no radical group could safely march again. What officer, after all, wants to go on record supporting the KKK or the Westboro Baptist Church—two groups that, despite their noxious views, have helped shape our national conversation around race and gay rights? The Supreme Court has affirmed both groups’ right to protest in public, but that right may evaporate once officers can opt out of protecting their demonstrations. The hypotheticals here are endless. If protecting a large group of gay people goes against an officer’s beliefs, what about a small one? Could a cop refuse to protect a group of gay men being assailed by homophobes because doing so would be endorsing their orientation or beliefs? Could an officer refuse to help a married gay couple in the midst of a robbery on the grounds that interacting with them would violate his religious principles? (A failed Kansas bill seemed to protect exactly that.) And what about other groups with contentious views? Could a pro-life group safely march through a radically liberal college town, or could progressive officers choose to stay home and let the marchers fend for themselves? Could a pro-choice group throw a rally in a deeply red state and count on law enforcement to protect them from attack? If the Salt Lake City officer can truly cite his religious principles as a reason to ditch the parade, all these hypotheticals are very much open questions. Rather than swear to protect the public, police officers might as well simply swear to protect the public whose politics and social views align with theirs. That’s the real debate at the heart of the Salt Lake City case: not just whether cops must protect pride marchers, but whether they can refuse to protect any demonstrators whom they happen to dislike. If religious liberty’s defenders balk at this startling threat to freedom of assembly, I hope they speak up now. We may disagree about wedding photographers and cake makers. But the menace posed in Salt Lake City reaches far beyond gay rights and religious refusal—and into the very core of democracy and liberty in America.